Abudu does not meet the criteria for any standard classification. It is an unclaimed Non-Aligned world located in the Jerik Subsector of Halcyon Sector. 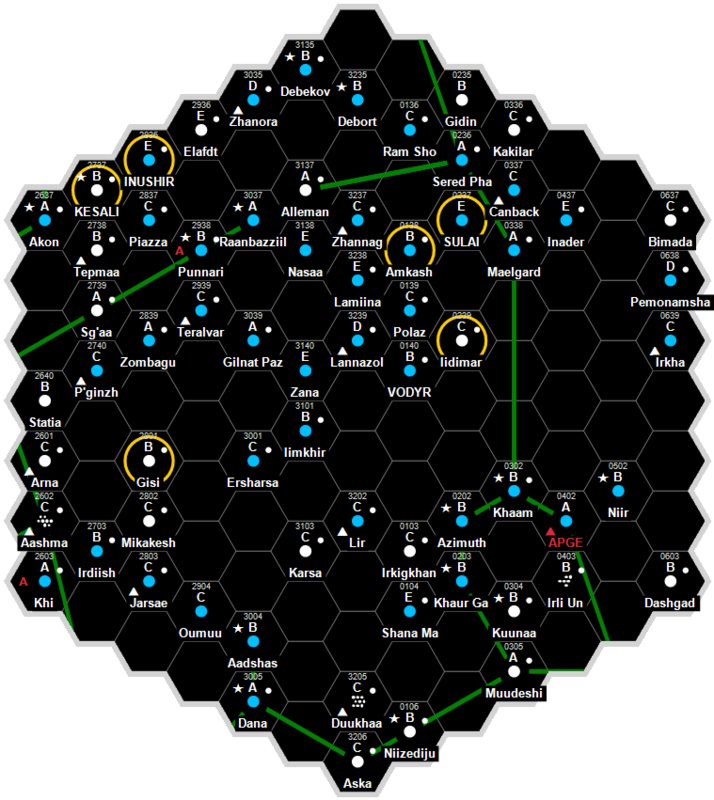 This star system is detailed using the Fringian Variant System Description. The primary is an unnamed F7 primary is an ordinary yellow-white main sequence star. It has a luminosity of 2.584 Sols, a mass of 1.196 Sols, and a diameter of 1.742 million km. The inner system consists of (I) a sparse stony planetoid belt, (II) a vacuum worldlet, (III) a corrosive atmosphere inferno world, (IV-I) a standard atmosphere hospitable water world, and (IV-II) a thin atmosphere hospitable world. (V) a dense atmosphere hospitable world orbits within the habitable zone. (VI) a very thin atmosphere hospitable world, (VII) a sparse stony planetoid belt, (VIII) a large gas giant, (IX) a ringed large gas giant, and (X) a small gas giant form the outer system. No world within the system has been designated the mainworld. The warm hospitable water world lying in orbital position (IV-I) (within the H– region of the inner system) has extensive, abundant native life, with complex organisms inhabiting every ecological niche. Their metabolic functions drive the process of atmospheric renewal. The hot marginally hospitable world lying in orbital position (IV-II) (within the H– region of the inner system) has primitive native life, consisting entirely of microscopic cyanobacteria-parallels that exist in any location where they can find even a minimal trace of shelter and moisture. Their metabolic functions maintain the process of atmospheric renewal. The temperate hospitable world lying in orbital position (V) (within the habitable zone) has extensive, abundant native life, with complex organisms inhabiting every ecological niche. Their metabolic functions drive the process of atmospheric renewal. The cold marginally hospitable world lying in orbital position (VI) (within the H+ region of the outer system) has primitive native life, consisting entirely of microscopic cyanobacteria-parallels that exist in any location where they can find even a minimal trace of shelter and warmth. Their metabolic functions maintain the process of atmospheric renewal. No other world in the system is known to have native life. The Abudu system has been studied by the Local Astrographical Survey Project, a part of the Astronomy Department of the University of Selasia. The Abudu system has no listed Starport data. The Abudu system has no listed Technology Level data. The Abudu system has no listed Government data. The Abudu system has no listed Population data. This page was last modified on 16 July 2018, at 22:05.